Yes, Welcome Home as our Home page says. Driving through the entrance to Westridge past the serpentine wall, the flowering trees and shrubs, the Swim and Racquet Club, you sense that here is something more than just a place to come home to at night. Here is the reward for all the work youve put in during the day. Westridge is a remarkable combination of uncompromising standards and respect for the land. Enjoy tennis and swimming at the Swim and Racquet Club. Soak away the days care in the whirlpool spa. Socialize in the community room or on the multi-level decks overlooking Westridge's 5-acre lake. Enjoy the monthly social activities sponsored by the Social Committee or volunteer to help out in your own neighborhood in a number of different ways. 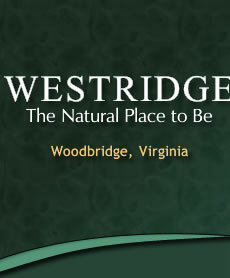 Westridge was incorporated in 1986 and full control of the association was turned over from the developer to the homeowners in 1989. Our association consists of 1531 units, a combination of apartments, condominiums, townhouses, and single-family homes. We have a clubhouse, two tennis courts, three pools, a lake and over 6 miles of walking trails. An additional benefit is that we have an elementary school right in the middle of the community where our children attend grades K thru 5. It is a beautiful community situated in the heart of historic Prince William County. We have a strategic vision that was developed in the mid-1990s and continues to be reviewed and used by the Board of Trustees as a guide in its decision making process. In 2004 the Board of Trustees adopted the CAI (Community Associations Institute) Rights and Responsibilities for Better Communities as a guide to the relationship between the Association and its members. This is published annually in the newsletter. We also use the budgeting process to fund and center the strategic planning, as the Board recognizes that in order to fulfill the community responsibilities of the future, a realistic budgeting plan has to be developed and followed. We have been very successful with this approach. The community is divided into thirteen neighborhoods, each responsible for developing their own budgets and overseeing the enforcement of our governing documents. Budget development is an on-going process, as we update reserve schedules based on actual expenditures and conditions and compile information for future operating expenses. Four months before the year-end our management agent solicits wish lists from all community leaders. That information is then placed in a draft budget, which is made available to all neighborhood board members and the Board of Trustees. The draft budget is reviewed at two open, advertised meetings of the Board of Trustees before the Board votes on adoption. Any changes requested by the neighborhood boards or by the Board of Trustees are made at this time. Once approved, it is published in the newsletter and made available for all owners. Westridge Swim and Racquet Club is a large association, which has come into its own as a premier community in Prince William County. More than 20 years after its inception, Westridge continues to be a vibrant community where people move from neighborhood to neighborhood within the community as their family needs change. Westridge is a desirable community, one that many people participate in through our swim team activities and volunteer opportunities. Westridge has been recognized twice by the Community Associations Institute Washington Metropolitan Chapter (WMCCAI) as the best community of its kind in Northern Virginia.